stylos: WM 120: White, Krans, Erasmus, and Beza: "One Volume Destruction"? WM 120: White, Krans, Erasmus, and Beza: "One Volume Destruction"? I have posted WM 120: White, Krans, Erasmus, and Beza: "One Volume Destruction"? After recent interactions with Calvinistic apologist JW regarding the 2019 Text and Canon Conference in Atlanta, scheduled for October 25-26, 2019 in Atlanta, I had been weighing the value of attempting to respond to any more of his misunderstandingsand misrepresentations of the traditional text position. On one hand, I think there are diminishing returns to these interactions, especially since JW does not seem to be making much effort or progress toward attempting to understand or represent our position. When I have offered critiques in the past of JW’s views as expressed on the DL it has usually been in response to those who have asked me to do so. On the other hand, I have been told that some have profited from these rejoinders and that the issues we will discuss in this issue might be helpful to some. I hope so. Again, after the recent Atlanta controversy, I did listen to at least parts of several episodes of the DL, in which JW makes reference to an academic book by Jan Krans that supposedly serves as a “one volume destruction” of the confessional or traditional text position. 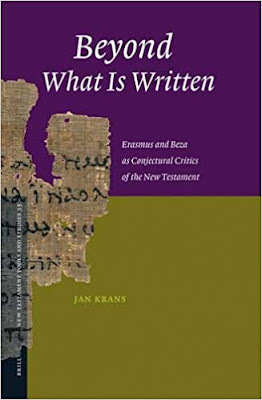 Jan Krans, Beyond What is Written: Erasmus and Beza as Conjectural Critics of the New Testament (Brill Academic, 2006). Ironically enough, this book appears in the “New Testament Tools and Studies”, co-edited by Bruce M. Metzger and Bart D. Ehrman, as Volume 35. In the acknowledgements, the author notes that this work is a revised edition of his 2004 PhD dissertation under professor Martin de Boer. Among those on his committee he lists text critic David Parker. In light of what I believe are some problems, misunderstandings and inconsistencies in JW’s use of Krans, I thought it might be helpful to offer some analysis. Beyond What is Written has a brief five-page General Introduction (1-5), and if you read that introduction you will immediately begin to see some of the problems inherent in JW’s attempt to use this book as a supposed “one volume destruction” of the confessional text position. First: JW does not acknowledge the underlying methodology represented in the Krans book, nor does he acknowledge its inconsistency with JW’s own methodology for doing text criticism. I find it interesting that JW is making of the Krans book to attempt to refute the traditional text position given that Krans would see JW’s reconstructionist approach to recovering the “original autograph” as outdated. “With the method adopted here, the present study takes part in the current paradigm shift in New Testament Textual Criticism. Manuscripts are no longer seen as mere sources for variant readings, but also as historical products that deserve to be studied as wholes. Moreover, variants readings as such no longer function as stepping stones towards the ‘original’ text, to be disposed of once this (chimeric) goal has been attained, but they acquire historical importance as mirrors of scribal convictions and conventions” (3). So, JW is using a source to fight against the traditional text position that is diametrically opposed to his own modern reconstructionist text position! I recall hearing JW lamenting when Muslims use liberal, rationalistic scholarship on the Bible that they would never apply to the Koran. But, by using Krans he is essentially doing the same thing (making use of liberal, rationalistic scholarship) to refute the traditional text position. It is absolutely no surprise to learn that Krans’s work will not support the traditional text position, grounded as it is in a relativistic, naturalistic worldview. The irony is that JW could not use Krans’s method to support his own position. This is inconsistent. Now, this is not meant to say that we cannot appreciate many aspects of Krans’s study. It is a formidable scholarly work. We would, however, be naïve if we did not consider the author’s method and worldview. Second: JW fails to notice the distinction that Krans draws in the General Introduction between two distinct types of emendations which he suggests would have been used by scholars like Erasmus and Beza in their study of the text, and which JW might well have applied with profit to his study of the texts like Revelation 16:5. Krans says, “In this period, emendation, the adoption of alternative readings, was done in two distinct ways, depending on the way these readings were found: they could either be derived from manuscripts or be arrived at by rational argument. Hence a distinction was made between emendatio codice ope (‘emendation by means of manuscripts’) and emendatio ingenii ope (‘emendation by means of reasoning’)” (4). In WM 117, I suggested that a key statement made by Beza himself in this textual commentary on the Greek text had apparently been misunderstood not only by KJV advocates (like the author of the KJVToday.com article, “Beza and Revelation 16:5”; see WM 115) but also, especially, by JW in his discussion of this verse in his book The King James Version Only Controversy (2009). Itaque ambigere non possum quin germana sit scriptura quam ex vetusto bonae fidei manuscripto codice restitui, nempe ο εσομενος. The problem is that both the KJV advocate and JW misunderstand this statement. They both think that Beza adopted this reading as an emendatio ingenii ope (‘emendation by means of reasoning’), rather than, as Beza clearly describes it, an emendatio codice ope (‘emendation by means of manuscripts’). “So why does the KJV read ‘and shalt be’? Because John Calvin’s successor at Geneva, Theodore Beza, conjectured that [sic] the original reading differently. To use his words, ‘ex vetusto bonae fidei manuscripto codice restitui.’ Beza believed that there was sufficient similarity between the Greek terms hosios and esomenos (the future form, ‘shall be’) to allow him to make the change to harmonize the text with other such language in Revelation. But he had no manuscript evidence in support of his conjecture” (The King James Only Controversy, 2009: 237). Clearly, JW did not properly understand the Latin text he quotes from Beza, as Beza clearly states that he got this reading “from an ancient manuscript [hand-written] codex of good faith.” JW, instead, offers this faulty conclusion, “But he had no manuscript evidence in support of his conjecture.” Hopefully, JW will correct this error if he ever issues a third edition of this work. Note also that according to the Scripture index in Beyond What is Written, Krans never addresses Revelation 16:5 as a conjecture. BTW, after WM 117 came out, I corresponded with James Snapp, Jr. about my translation of Beza’s statement on Revelation 16:5.
" I will have a new book this year, with among other things an update on the Beza part, and a lengthy treatment of this case [in Rev. 16:5] in particular. Shortest version: Beza states that he had a manuscript, but wrongly so, because he misinterpreted one of his own handwritten notes. It is therefore a conjecture, by Beza, but he would probably not have changed his text, had he not misunderstood his notes. In that case he would also have written a different annotation, probably with the conjecture as a suggestion only." Jan Krans apparently agrees with my translation of Beza. Beza wrote that he got the reading he uses in his text from a manuscript. Despite this, Krans apparently will make an argument in a forthcoming work that Beza was mistaken when he made this statement. He will argue that Beza misread his notes. We’ll have to wait to see what he writes, but it is hard to conceive that he will be able definitively to prove that Beza merely misread his notes. The more obvious conclusion is that he had what he says he had: a handwritten Greek codex that read ho esemenos. Beza’s reading at Revelation 16:5 came from a manuscript and not from bare reasoning. First, if he persists in saying my translation is wrong, he should provide his own translation of the Latin sentence he quotes in his book to show that my translation (supported by Krans) of Beza is wrong. Second, he should concede that it is by no means fantastical to conceive the possibility that Beza had a Greek ms. which reflected the reading he adopted at Revelation 16:5 and that this ms. might have been lost. To deny the latter would be grossly inconsistent given that JW makes much of Erasmus’s supposedly faulty use of ms. 2814 for the ending of Revelation which, according to Kranz, “was lost for a long time” and was only “rediscovered in the middle of the nineteenth century by Franz Delitzsch” (Beyond What is Written, 54). Clearly, mss. used by the likes of Erasmus and Beza could be lost (and might also be recovered)! Krans, for example, is much, much more judicious than JW, and rightly so, when he makes his argument. For example, at the close of his discussion of Erasmus’s text of Revelation, he says the following: “In conclusion, Erasmus treats the Greek text of the book of Revelation in a special way, at times providing Greek readings for which no manuscript sources is known” (58). That sentence reflects proper humility and circumspection. No manuscript sources may be known, but that does not mean they did not exist and were available to Erasmus in some form. Third, JW fails to acknowledge one of the central themes of Krans’s work: that although Erasmus and Beza offered many conjectures (of both types as previously described) in their various writings, notes, and annotations, when it came to their printed texts of the Greek NT they were exceedingly careful and “conservative” in their transmission of the Greek received text. “It should finally be noted that most conjectures discussed in this study were never printed as part of the Greek New Testament. They have their Sitz-im-leben in annotations and commentaries. Indeed, a recurrent theme of this study is the tendency of Erasmus and Beza to propose conjectures without actually implementing them” (5). “Erasmus often insisted on both points, the subservient place of his translation vis-à-vis the ecclesiastical text, and his unwillingness to print a Greek text that differs from his manuscripts.” Krans’s point: Eramus had a high view of the Greek text and did not want to provide readings in his Greek text that were not based on extant Greek mss.” (20). In Krans’s conclusion to his study of Erasmus (chapter seven), he returns to this key theme of his work, noting “the place (or even Sitz-im-Leben) of most conjectures is in the Annotations, not the printed Greek or Latin text” (189). He adds: “The real conjectures are found somewhat hidden in a wealth of text-critical commentary, philological (semantic and grammatical) remarks, exegetical information and in fact all kinds of contemporary reflections and polemics that their versatile author was capable of producing” (189). Later, he even suggests that Erasmus “was also handicapped by his concept of the Graeca veritas, which he at least initially sought one-sidedly in the (Byzantine) Greek text” (189). Of course, what Krans sees as a handicap, we see as an advantage. JW clearly does not acknowledge this central theme in Krans’s study, since it does not support his attack on the TR by way of attacking the scholarship of Erasmus. These responses, of course, only touch the surface. Much, much more could be said. Attacks on Erasmus have been taken up by many since the nineteenth century in their zeal to unseat the dominance of the TR. Although in the providence of God, Erasmus was used to bring the traditional text into print for the first time in 1516, the TR does not depend solely on him or his erudition. Nor does it depend on his theological orthodoxy, his theology of Scripture, or his view of canon (including the canonicity of Revelation). The text printed by Erasmus was studied, (in some cases) improved, in other cases simply affirmed, and published by sound Protestant and Reformed men (like Stephanus and Beza), till by 1633 it could be called by the Elzevirs the Textus Receptus. It was the basis of the Protestant Bible translations of the Reformation and post-Reformation period, as well as the prooftexts of the Protestant and Reformed confessions of faith. It remains formidable to this day, despite its critics, past and present. For those interested in reading more about attempts to undermine the credibility of the TR by means of attacking Erasmus, see my article “Erasmus Anecdotes” in PRJ, vol. 9, no. 1 (2017): 101-112. In a footnote in that article, I note that further work needs to be done on other Erasmus anecdotes (or scholarly legends): “This article has surveyed two such frequently shared anecdotes. Others, however, may also be worthy of further scrutiny, including the question of the number and quality of the Greek mss. which Erasmus used to create his Greek text, the origins of Codex 61, the mss. Erasmus made use of for his text of Revelation, and the supposed back-translation of the final verses of Revelation 22” (n. 41, p. 112). For now, suffice to say that I believe there are many good reasons to believe that the entire back-translation of the final verses of Revelation account does not rest on solid foundations but was likely promoted, beginning in the nineteenth century, like other anti-Erasmus anecdotes, in order to undermine the reliability of the TR in favor of the then-emerging critical text. That study, however, will have to wait for another day…. Yes, I heard about it. Thanks for the heads up. I think JW is pretty concerned about the confessional text movement. I listened to James Whites response on Dividing Line. He still continues to makes claims about your position to which you do not hold. I don't know who he is responding to for half of his response, but it certainly isn't you. I think he has spent so much time contending against heretical KJV-onlyism, that he doesn't know how to respond to a fellow reformed baptist who disagrees for legitimate reasons. He ends up resorting to character assassination which sounded a little too KJV-onlyist in attitude. I love Brother James and appreciate his ministry, but he needs to consider this, not just reject it on its face because its not the modern text. PLEASE keep up the faithful diligent work. KSA, thanks for the encouragement. As noted in WM 120 I have wavered on whether or not it is profitable to do these types of responses to JW. Glad you found some profit in it.